Well, how are you all doing? I hope you had a great weekend. Just to let y’all know I hit my goal plus 35 more pounds at the meet. I wanted to hit 1100 and I hit 1135 and actually won my weight class. That was a surprise and probably has more to do with the experience level that entered as a lightweight raw than anything else, but I am pretty darn happy and proud of how it went. I was happy with that, as it bested my previous PR by about 8 pounds. “Way to go, spotters,” is not what you want to hear after your lift. The good news about my bench is that it really didn’t feel heavy at all until it stopped moving. I know that sounds funny, but it’s true. I think I’m getting stronger at bench, but it’s not really showing in the lift yet. Needs more work, but I’ll get there. At this point I was annoyed, but I knew that I was still on track for my goal of an 1100 total. Also, surprisingly I was the leader in my weight class. I noticed that my squat beat second place by about 25 kilos and my bench was behind by about 10 kilos putting me about 15 kilos in the lead. I also noticed that the second place lifter was opening the deadlift about 25 kilos heavier than me. The final lift is the Deadlift. This has always been my best lift. I opened at about 385 and smashed it. I went up to 439 which is about a 4 pound PR and I really smashed that. I was thinking about about maybe 450 when Jesse told me to go up about 50 pounds. I figured OK although I hedged a bit and went up 35 pounds to 474. Also, at this point I was 7 kilos ahead of second place and I knew that if I hit my lift I would win. I’ve got to say I was pretty darned ecstatic about this lift. I thought I maybe had 450 in me, but I didn’t think I had this. It went up pretty easy, too. 500 next time! All in all it was a great day and I can’t wait for the next meet! 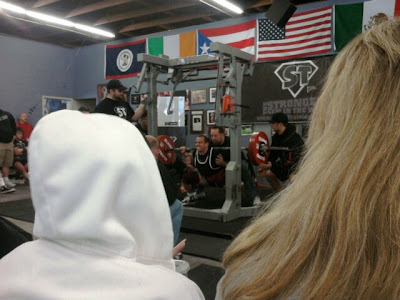 In closing here’s a great pic that Kate took of my 413 squat. P.S. Sorry for the video quality. I accidentally left the battery on in my video camera and I had to use my phone for the videos. I’ll get that right next time. I have a new article coming up tomorrow. Enjoy!